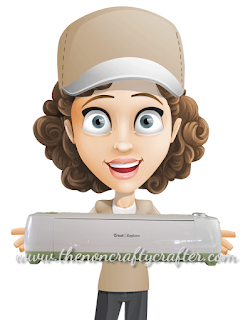 Have you seen the new Cricut Faux Leather? It looks and feels just like real leather and you can cut it in your Cricut! I recently had to renew my passport as it was about to expire so I decided to use the Faux Leather to make a passport holder to replace the daggy plastic one that the new passport came in. 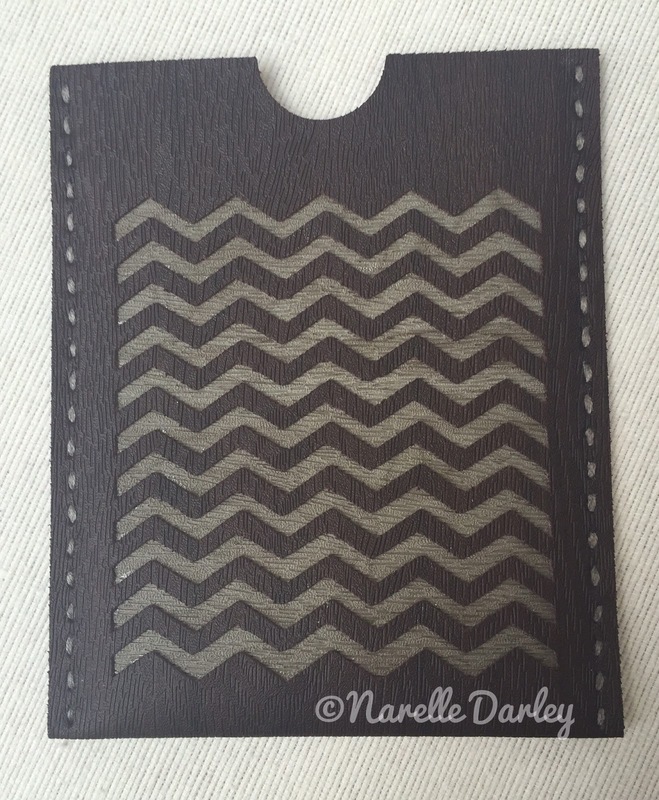 I used the sheet of Espresso Faux Leather from the Faux Leather, Woodgrain Sampler pack. Right now it's on sale for $8.99 (reg $14.99) at Cricut.com. The sampler pack comes with five 12" x 12" sheets of Faux leather. One each of Charcoal, Boxwood, Ash, Walnut, and Espresso. You can also purchase individual rolls of the Faux leather. Each roll is 12" x 24". For my project I used a square from the Insert Shapes tool in Design Space and unlocked the dimensions so I could make it a rectangle. I added a score mark (it didn't score but did leave a mark so I could see where I needed to fold) then used two circles to slice out the tab at the top and bottom of the rectangle. I used the Align tool to perfectly centre the circles. I then sliced an image from the Edge to Edge cartridge into the top section of the rectangle. I used another square to create the backing for the sliced out image. For the stitching I used the Stampin' Up! paper piercing & stitching guide to create the holes then sewed it up using white embroidery thread that I coloured with a grey (W6) Copic alcohol marker. The faux leather cut beautifully in my Cricut Explore. Make sure you follow the instructions in the pack. 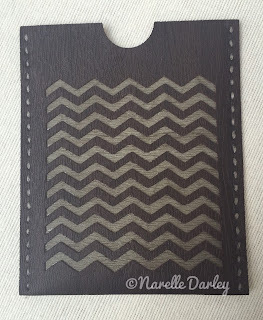 As the Cricut Faux Leather Custom setting cuts three times you need a very sticky mat so it doesn't lift. You only need the regular blade for this material. 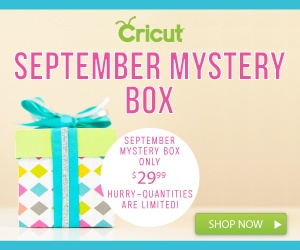 Add some mystery to your life and take advantage of the Cricut September Mystery Box! You'll get 4 new materials, 2 accessories and 1 cartridge, a $100 value for just $29.99. The exact contents in the box may be a mystery, but the savings sure aren't! Don’t wait, supplies are limited, so be sure to take advantage of this great deal today at Cricut.com. To celebrate fall, Cricut is offering great sales that you're not going to want to miss! The Cricut Labor Day Sale starts today: For two days only 90 cartridge titles are on sale for $14.99 or less and most supplies are 40% off! In addition, Cricut is offering $20 off the Cricut Explore Air Everything Bundle. Be sure to visit Cricut today to take advantage of these sales and more going on now. Be sure to use the code FALLSHIP to get free shipping in the USA (48) on orders over $30. The Hungry JPEG has a new font bundle for September. 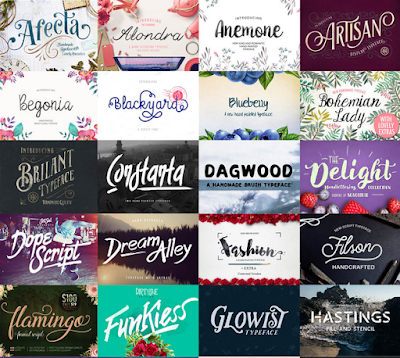 This bundle includes an incredible 49 fonts plus another 17 FREE bonus fonts! This awesome pack is priced at over 95% discount, and works out at just $0.43 per font. But hurry, it's only available during September 2015. Here's a preview of just some of the fonts. All products included can be be used for both personal and commercial use. That brings the cost down to $23.20 which is 35 cents per font! Not only do you get all those fonts, there's also loads of graphics, dingbats and other extras. These extras are generally in AI, EPS and PSD formats. As Design Space can't read those types of files you will need to convert them into a PNG. That's super easy to do! I did a quick Google search and found many online options available for converting EPS files. ImageOnline-convert.com is a site we already recommend for converting images. Once you've converted the files you'll use the Upload Image option in Design Space to import it. You'll be able to use these in the upcoming Design Space update! Cricut have been hard at work on the next release of Design Space! I've put a video together to quickly give you a preview of what's coming. Please remember, this is a beta preview. You won't see this in the current production version yet! Cricut: Save on Machine Sets, Materials, Mats + More! Have you been thinking about buying a Cricut Explore Air™? Well, now is the time to treat yourself! 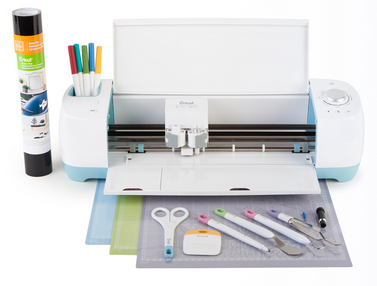 Right now at Cricut for just $299, you can get the Cricut Explore Air™ + Ultimate Machine Set. This special bundle includes the Cricut Explore Air™ electronic cutting machine, the Cricut®Cutting Mat Variety 3 pack, a Cricut Explore® Deep Cut Blade With Housing, a Cricut® Tools Basic Set, and more! Everything you'll need to make beautiful cards, labels, gift tags, or whatever creations you can dream up is included in this handy set. The offer is for a limited time only, so don't miss your chance to get everything you need to hit the ground running in one great deal! Get Cricut Material and Mat Sets for Up to 40% Off!